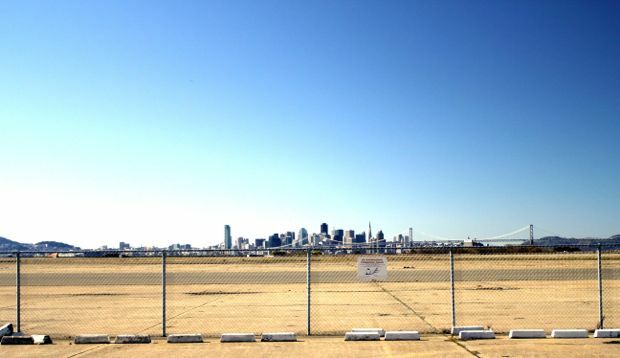 The old Alameda Naval Air Station sits just across the bay, facing San Francisco’s panoramic skyline. It’s not much to look at, its worn buildings don windows boarded up long ago, and concrete walls exposed behind chipped paint. 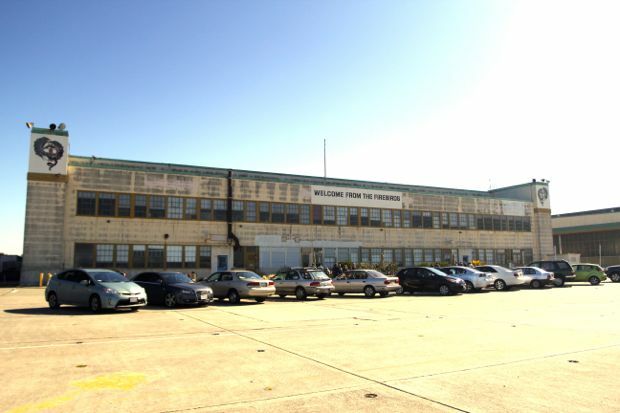 Set at the edge of the Air Station is a 65,000 square foot space, once an airplane hangar, now the home of St. George Spirits artisan distillery. 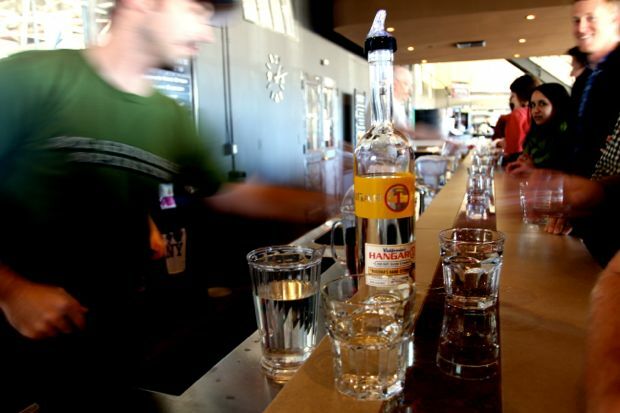 St. George Spirits is best known for producing Hangar One Vodka, a staple on the shelves of restaurants and bars across the Bay Area. Under the same roof, the company produces various spirits, including absinthe, single malt whiskey, gin, and a variety of fruit liqueurs. The location boasts a panoramic view of San Francisco just across the bay. Picnic tables just outside the building give visitors an opportunity to take in the view over lunch, before heading inside. Wednesday through Sunday, the distillery opens to the public for tours and spirit tasting. The tour takes you through the production area, starting with an explanation of the equipment used to distill alcohol. On the day that our group took a tour of the distillery, they happened to be producing rum. 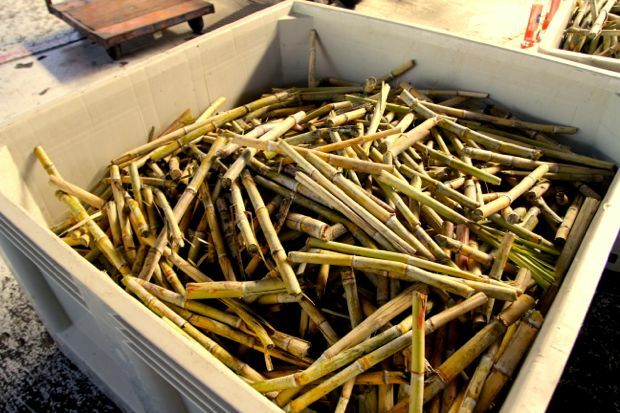 Crates of sugar cane lined the floors and we watched as they fed each one through a machine that extracted the pure sugar cane juice. 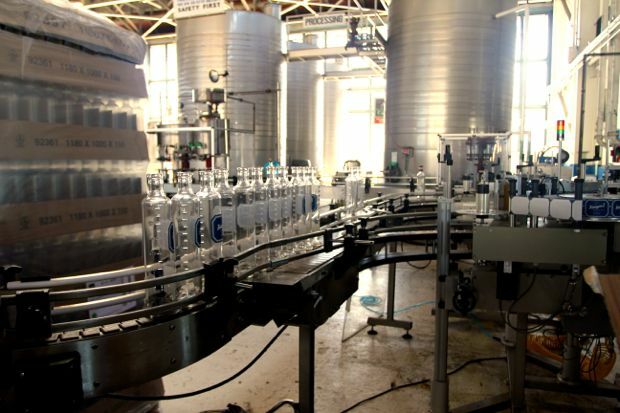 The tour then moves on to the bottling line, where you see how the alcohol is actually packaged and shipped to market. Towards the back of the hangar sit 80 oak barrels full of 5 – 7 year old Kentucky bourbon, which were transported to California to be blended into St. George Spirits’ new line of ‘Breaking and Entering’ bourbon. 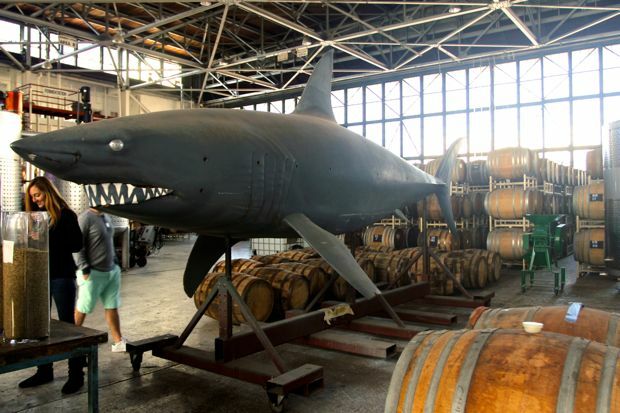 The last leg of the tour brings you to a 15-foot shark, gifted to the distillery by former neighbors. 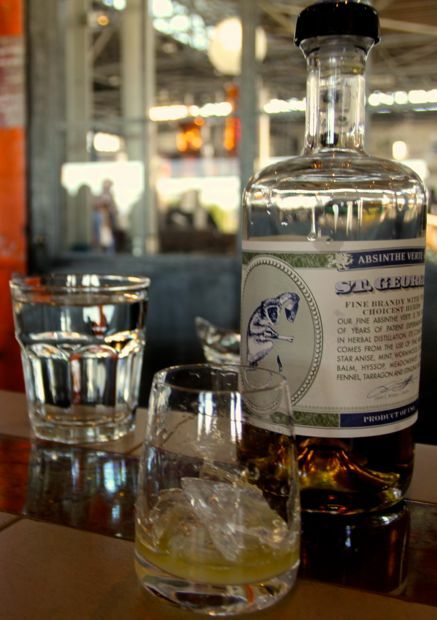 Under the shark, the production of absinthe, as well as the blend of herbs used to create it, is explained. At the conclusion of the tour, guests are invited to participate in a tasting that includes six different spirits, all of which are made on the property. 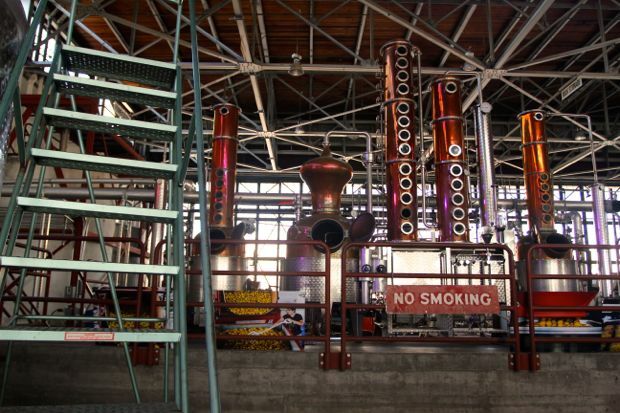 The distillery tour is well worth the half-day trip to Alameda. The guides and staff at St. George Spirits are both fun and well-versed in their craft, making the experience educational and memorable. 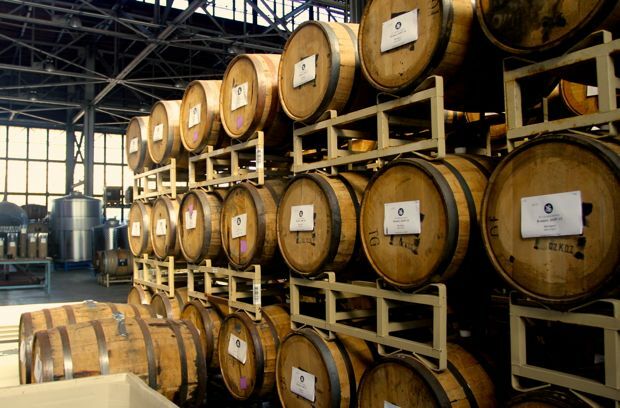 This entry was posted in Do, San Francisco and tagged Absinthe, Alameda, bay area, Bourbon, Breaking and Entering Bourbon, Day trips, Distillery, Distillery Tour, Gin, Hangar One, Rum, Spirit Tasting, St. George Spirits, Vodka. Thanks for sharing. Looks like I’ll need to make a trip with J to check this out!